What is a LOOP ? A loop is simply a statement which can execute a set of defined statements repetitively. 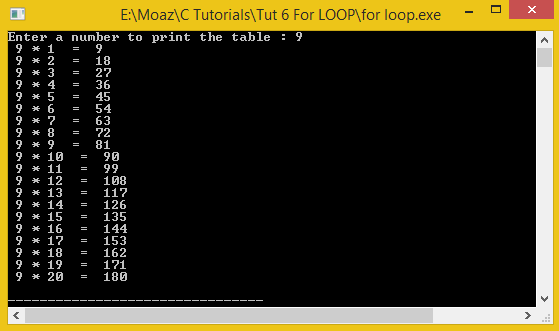 You can write any valid C statement within a loop and you can also set how many times to execute that certain statement. Today we will discuss for loop. First of all we will declare 3 integers named as ‘num1’,’num2’ and ’ans’, here we have declared 3 integers because in a table we will need two integer type variables on which a specific operation will be performed and the result after the operation will be stored in the third integer type variable. In this program we will only use these variables to take input and storing result as well. In the end the multiplication table will be displayed on the console. Now we are taking inputs from the user, The user will enter the number and then we will run a loop to find the table of that number. In the for loop notice that there are two semi colon’s which divides the bracket into three parts. The condition before first semicolon is the initialization. The condition before second semi colon is condition and the condition after semi colon is the increment. We will simply multiply the number (given by user) with the for loop variable count which will start from 1 and go till 20. Incrementing every time the for loop runs. Then we end the program. Simply writing the headers and declaring the variables number for defining the limit to print the series. Count for loop , prime variable for loop , choice for switching , notPrime variable is a flag (1 represents true and 0 will represent false ), ans variable to store the answer. In the switch statement we write 3 cases for switching between odd even and prime. The first case is for odd in this case we will run a for loop from 1 to the number (given by user) and check if it has remainder is not equal to 0 when it is divided by 2. if the remainder is not equal 0 when divided by 2 then it is an odd number so we simply print it and move on to the next number of the loop. (REMEMBER % is called modulus operator used to find remainder of a number ). In this case we will find the even numbers we simply run a loop from 1 to number (given by user) and check if the loop variable if it’s divisible by 2 if yes then it is an even number so we simple print it. In the third case we are finding the prime number series for that we need two nested for loops (loop within a loop ). 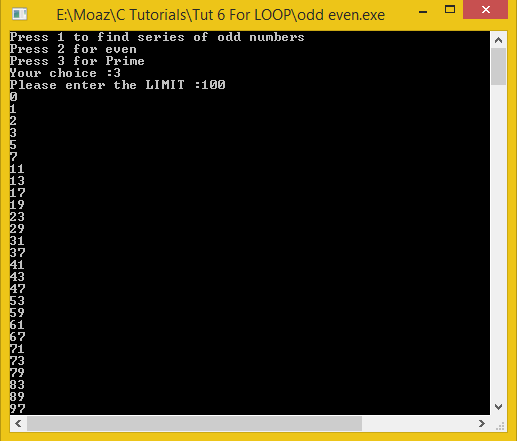 One loop for printing the numbers and other one for checking whether the number is prime or not. First we will set the prime variable to 0. Then we will run a 2nd loop and then check the modulus of the every variable of first loop by the complete second loop. Then after checking we will simply check if the number is prime then print otherwise end.